Small bathroom ideas sometimes get the wrong approach. Maybe the homeowner tries to incorporate everything that would normally work in a larger space, but the room ends up feeling cramped. Or maybe the opposite is true with sparse décor and under-scale fixtures, and it seems more suited for a child than an adult. The right balance is in the middle, and it’s easier to achieve than you might think. Here are 6 ideas for your small bathroom to make it less of an afterthought and more like another beautiful room in your home. There’s a difference between a small sink and one that’s designed to conserve space. Pedestal sinks are classic small bath fixtures, or you can go with a corner sink to make the most of the square footage. Toilets and bathtubs come in space-saving dimensions, too, where even an inch of width makes a difference without affecting functionality. One of the biggest mistakes in a small bath is avoiding dramatic features. They can work perfectly as long as you keep them from overtaking the whole room. Ceiling-to-floor metallic tiles make a beautiful backdrop behind the sink. Or use a bold mirror with an elaborate, gilt frame. Large and dramatic pieces make a small space look special, just limit them to one or two. 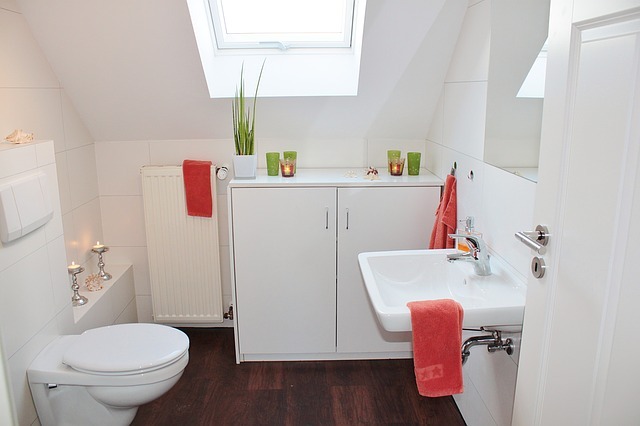 The streamlined look of some décor themes is ideal for a tiny bathroom. Asian style, for example, focuses on less ornamentation and more open space. Urban loft design has the same idea, with its sleek metals, straight lines and few fussy details. The bathroom isn’t like the kitchen, where you need deep cupboards and plenty of them. Bathroom cabinetry can work just as well if it’s not quite as deep. Shallower cupboards leave more floor space open, which This Old House says avoids tight quarters, but still makes the room look well appointed with plenty of storage. Some flooring can make a small bathroom look even tinier. That’s what happens when you install 12-inch or larger floor tiles or wide planks. A better route is to go with small tiles, such as vintage-inspired penny tiles or small-scale basketweave in marble. Another small-scale look that’s a bit more modern is penny tiles in cork. They’re softer and warmer underfoot, too. You aren’t stuck with the floor plan that you’ve got, says HGTV. The builder might have arranged your small bath in the most convenient way for his plumber instead of the best way for living. Get some graph paper and draw out the room’s boundaries. Inside them, anything goes. Plumbing can be rerouted, and fixtures can be moved. You might find that by swapping places with the vanity and bathtub, you gain a more functional bathroom. Small bathrooms might be short on floor space, but they can still be functional and beautiful. Instead of looking at the small square footage as a hurdle to overcome, try to imagine ways that you can enhance it and make it a better version of its current self. If you’re ready for a small bathroom remodel, the first thing that you need is a great contractor. Let Contractor Connection help you find the right one by downloading our mobile app today.